TBI Blog: Will Brain Injury Lawsuits Doom or Save the NFL? Will Brain Injury Lawsuits Doom or Save the NFL? When Gene Locks led Princeton against Columbia on Oct. 7, 1957, it took the Tigers quarterback only a few plays to discover “that the middle of the Columbia line was paper thin,” according to the Daily Princetonian. In the Tigers’ single-wing offense, Locks served as a blocker, leaving “gaping holes” in Columbia’s defense on the way to a 47-6 wipeout. This pecuniary feast is what makes the NFL so attractive to legal predators like Locks, although he and the other plaintiffs’ lawyers say they have no interest in putting the NFL out of business. “I love football,” Locks says. “No attorney ever said, ‘I love asbestos.’ ” So there’s reason to believe the ex-players’ lawsuit could produce a reasonable settlement. And yet the litigation could still metastasize and become life-threatening to the game if the NFL chooses to draw out the court fight rather than seek a swift resolution. 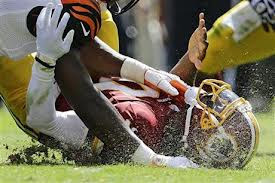 A protracted battle could provide the plaintiffs’ lawyers with an opportunity to reveal sordid details about a period during which they allege the NFL intentionally obfuscated evidence of the long-term brain damage suffered by its willing gladiators. If this is true, and if the ugly particulars are played out in depositions, internal documents, and court testimony, such a legacy could alienate fans already uneasy about the suicides of former players such as Dave Duerson, Andre Waters, and Junior Seau, all of whom suffered from neurodegenerative brain disease linked to concussions. Beyond the present litigation, the NFL faces a more ominous longer-term question. New research suggests the peril players face may not be limited to car wreck hits. It may extend to the relentless, day-in-and-day-out collisions that are the essence of the game. If science one day determines that merely playing serious tackle football substantially increases the danger of debilitating brain disease—as smoking cigarettes makes lung cancer much more likely—it’s conceivable that the NFL could go the way of professional boxing. In 1903, before the NFL existed, the New York Times compared college football, then the top of the line, to “mayhem and homicide.” The following year, 18 campus players died from head injuries. In 1905, President Theodore Roosevelt summoned college representatives to the White House to demand reform; rules began to change. Introducing the forward pass and the 10-yard first down led to a more fluid, less dangerous contest. Over time, protective equipment improved. Football remained savage, though, and from time to time honest observers wondered aloud whether the entertainment was worth all the human wreckage. In 1978, Sports Illustrated warned: “As football injuries mount, lawsuits increase, and insurance rates soar, the game is headed toward a crisis.” Sixteen years later, in 1994, SI again sounded the alarm about “disturbing statistical and anecdotal evidence that concussions are the silent epidemic of football.” Head injury has never been a secret to anyone who played, or even closely watched, the game. Dallas Cowboys quarterback Roger Staubach retired after suffering 20 concussions, the SI piece said. Ex-Philadelphia Eagles passer Ron Jaworski counted 30. Having punted on the brain injury issue, the NFL seemed to hope it would go away, but it didn’t. To a surprising degree, that was because of one college-player-turned-activist.